Go to original pattern for design DROPS 149-46. 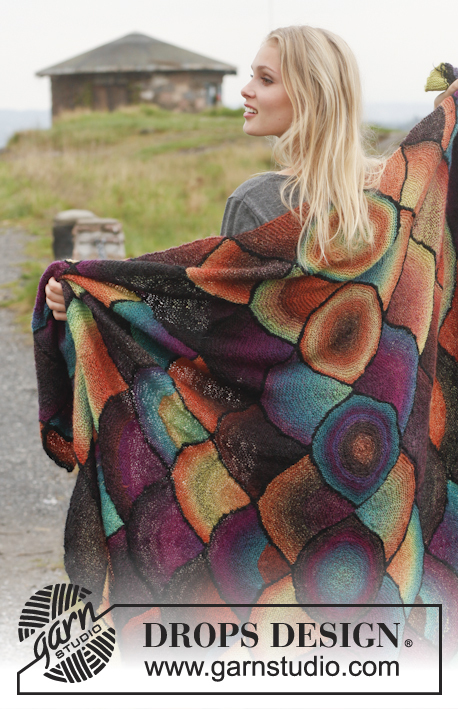 Knitted DROPS blanket with fans in "Delight" and "Alpaca". DROPS DOUBLE POINTED NEEDLES (x 2) and CIRCULAR NEEDLE (80 cm) SIZE 4.5 mm - or size needed to get 21 sts x 40 rows in garter st = 10 x 10 cm. 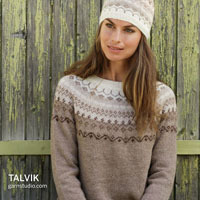 You can get the yarn to make this pattern from	29.40£. Read more. Diagram A.1 shows the entire bottom part on blanket with fan pattern, seen from RS. Blanket consists of several fans worked together along the way. Beg at the bottom of blanket in the order fans are numbered - see A.1. Work 2 parts that are sewn tog in the middle so that blanket is the same in both sides. Always pick up new sts from RS. The first 2 rows on every fan are worked with Alpaca, then finish fan with Delight. Row 1 (= RS): K all sts. Row 2 (= WS): K all sts. Row 3: Switch to Delight, K 2 tog, K 9, * slip 1 st as if to K, K 2 tog, psso, K 6 *, repeat from *-* 5 times in total, K 3, K 2 tog = 49 sts. Row 4-10: K all sts. Row 11: K 2 tog, K 7, * slip 1 st as if to K, K 2 tog, psso, K 4 *, repeat from *-* 5 times in total, K 3, K 2 tog = 37 sts. Row 12-18: K all sts. Row 19: K 2 tog, K 5, * slip 1 st as if to K, K 2 tog, psso, K 7 *, repeat from *-* 2 times in total, slip 1 st as if to K, K 2 tog, psso, K 5, K 2 tog = 29 sts. Row 20-26: K all sts. Row 27: K 2 tog, K 3, * slip 1 st as if to K, K 2 tog, psso, K 5 *, repeat from *-* 2 times in total, slip 1 st as if to K, K 2 tog, psso, K 3, K 2 tog = 21 sts. Row 28-34: K all sts. Row 35: K 2 tog, K 7, slip 1 st as if to K, K 2 tog, psso, K 7, K 2 tog = 17 sts. Row 36-42: K all sts. Row 43: K 2 tog, K 5, slip 1 st as if to K, K 2 tog, psso, K 5, K 2 tog = 13 sts. Row 44-48: K all sts. Row 49: K 2 tog, K 3, slip 1 st as if to K, K 2 tog, psso, K 3, K 2 tog = 9 sts. Row 50-54: K all sts. Row 55: K 2 tog, K 1, slip 1 st as if to K, K 2 tog, psso, K 1, K 2 tog = 5 sts. Row 56-58: K all sts. Row 59: K 1, slip 1 st as if to K, K 2 tog, psso, K 1 = 3 sts. Row 60: K all sts. Row 61: Slip 1 st as if to K, K 2 tog, psso = 1 st. Cut the yarn, pull it through st and fasten. Work FAN 2A, 3A etc. on 1st row the same way. Row 3: Switch to Delight, K 2 tog, K 9, * slip 1 st as if to K, K 2 tog, psso, K 6 *, repeat from *-* 2 times in total, slip 1 st as if to K, K 1, psso = 25 sts. Row 11: K 2 tog, K 7, * slip 1 st as if to K, K 2 tog, psso, K 4 *, repeat from *-* 2 times in total, slip 1 st as if to K, K 1, psso = 19 sts. Row 19: K 2 tog, K 5, slip 1 st as if to K, K 2 tog, psso, K 7, slip 1 st as if to K, K 1, psso = 15 sts. Row 27: K 2 tog, K 3, slip 1 st as if to K, K 2 tog, psso, K 5, slip 1 st as if to K, K 1, psso = 11 sts. Row 35: K 2 tog, K 7, slip 1 st as if to K, K 1, psso = 9 sts. Row 43: K 2 tog, K 5, slip 1 st as if to K, K 1, psso = 7 sts. Row 49: K 2 tog, K 3, slip 1 st as if to K, K 1, psso = 5 sts. Row 55: K 2 tog, K 1, slip 1 st as if to K, K 1, psso = 3 sts. Row 56-60: K all sts. Cast on 31 sts with Alpaca and work as fan 1B but reversed (i.e. on 3rd-11th-19th-27th-35th-43rd-49th-55th and 61st row read sentence backwards, but beg with K 2 tog and finish with slip 1 st as if to K, K 1, psso – E.g. work 3rd row as follows: K 2 tog, * K 6, slip 1 st as if to K, K 2 tog, psso *, repeat from *-* 2 times in total, K 9, slip 1 st as if to K, K 1, psso = 25 sts). First row with fans has now been worked. Pick up 30 sts with Alpaca along FAN 2B's left edge (seen from RS), and pick up 31 sts along FAN 1A's right edge (seen from RS) = 61 sts on needle. Then work FAN 1A but from 2nd row (i.e. beg with K from WS). 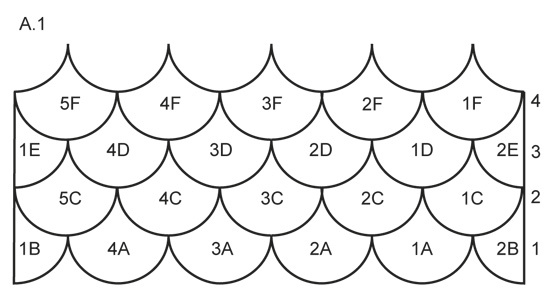 Work FAN 2C, 3C, 4C and 5C on 2nd row the same way – see placement in diagram A.1. Second row with fans has now been worked. Work FAN 1D, 2D, 3D and 4D on 3rd row the same way – see placement in diagram A.1, but when picking up, do as follows (example explains fan 1D): Pick up 30 sts with Alpaca along FAN 1C's left edge (seen from RS), pick up 1 st at the top of tip on FAN 1A and finally pick up 30 sts along FAN 2C's right edge (seen from RS) = 61 sts on needle. Pick up 30 sts with Alpaca along left edge (seen from RS) on last fan on 2nd row, pick in addition up 1 st in the tip at the top on FAN 1B = 31 sts on needle. Then work FAN 1B but from 2nd row (i.e. beg with K from WS). Pick up 1 st with Alpaca in the tip at the top on FAN 2B, then pick up 30 sts along FAN 1C's right edge (seen from RS) = 31 sts on needle. Then work FAN 2B but from 2nd row (i.e. beg with K from WS). Third row with fans has now been worked. Pick up 30 sts with Alpaca along FAN 2E's left edge (seen from RS), pick up 1 st at the top of tip on FAN 1C and then pick up 30 sts along FAN 1D's right edge (seen from RS) = 61 sts on needle. Then work FAN 1A but from 2nd row (i.e. beg with K from WS). Work FAN 2F, 3F, 4F and 5F the same way. Continue like this upwards (repeat the last 2 rows with fans) until blanket measures 75 cm, finish after a row with 4 whole and 2 half fans. 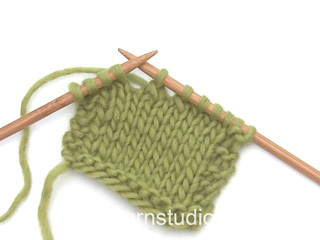 Put piece aside and knit another part the same way. CIRCLE: Work 5 circles that are sewn on to the middle of blanket. 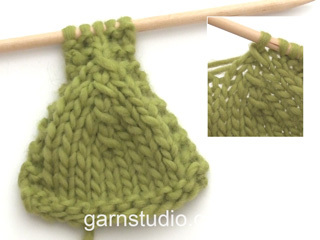 Work in the round on double pointed needles from centre and outwards. 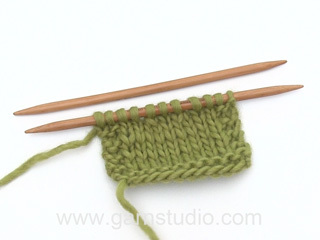 Cast on 6 sts evenly on 3 double pointed needles size 4.5 mm (= 2 sts per needle) with Delight. ROUND 1: P all sts. ROUND 2: K all sts. ROUND 3: Work * P 1, 1 YO *, repeat from *-* = 12 sts. ROUND 4: K all sts, K the YOs twisted (i.e. work in back loop of sts instead of front to avoid holes). ROUND 5: P all sts. ROUND 6: K all sts. Now continue to work on 7 double pointed needles. 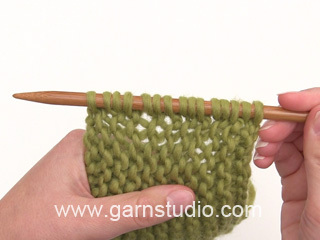 Distribute sts evenly on 6 double pointed needles so that there are 2 sts per needle. ROUND 7: Work * P 1, 1 YO, P 1, 1 YO *, repeat from *-* = 24 sts (= 4 sts per needle). ROUND 8-10: As 4th-6th round. ROUND 11: Work * P 1, 1 YO, P 3, 1 YO *, repeat from *-* = 36 sts. ROUND 12-14: As 4th-6th round. ROUND 15: Work * P 2, 1 YO, P 1, 1 YO, P 3 *, repeat from *-* = 48 sts. ROUND 16-18: As 4th-6th round. ROUND 19: Work * P 1, 1 YO, P 5, 1 YO, P 2 *, repeat from *-* = 60 sts. ROUND 20-22: As 4th-6th round. ROUND 23: Work * P 3, 1 YO, P 1, 1 YO, P 6 *, repeat from *-* = 72 sts. ROUND 24-26: As 4th-6th round. ROUND 27: Work * P 1, 1 YO, P 7, 1 YO, P 4 *, repeat from *-* = 84 sts. ROUND 28-30: As 4th-6th round. ROUND 31: Work * P 4, 1 YO, P 1, 1 YO, P 9 *, repeat from *-* = 96 sts. ROUND 32-34: As 4th-6th round. ROUND 35: Work * P 1, 1 YO, P 9, 1 YO, P 6 *, repeat from *-* = 108 sts. ROUND 36-38: As 4th-6th round. ROUND 39: Work * P 5, 1 YO, P 1, 1 YO, P 12 *, repeat from *-* = 120 sts. ROUND 40-42: As 4th-6th round. ROUND 43: Switch to Alpaca. Work * P 1, 1 YO, P 11, 1 YO, P 8 *, repeat from *-* = 132 sts. ROUND 44: LOOSELY cast off with K over all sts. Cut the yarn and keep approx. 50 cm for assembly. Fasten the two parts of blanket tog, with circles in the middle. Goedendag, Ik vind deze deken echt prachtig, maar ben niet zo thuis in breien. Is er een soortgelijk patroon om te haken? De cirkels lukt wel maar hoe tel ik de waaiers uit? Ik ben benieuwd. Helaas is er niet een dergelijk haakpatroon voor deze deken. Je kan natuurlijk wel even zoeken bij de haakpatronen voor dekens. De waaiers worden gaandeweg tijdens het breien aan elkaar gebreid, tijdens het breien wordt dit wel duidelijk als je gewoon het patroon volgt. Onderaan het patroon staat een schema, zodat je kunt zien waar welke waaiers komen. Når I nu har konstateret, at garnmængden på alpaca kun skal være 100 g, hvorfor retter I det så ikke oppe i toppen, hvor man finder oplysninger om garnforbrug? Nu har jeg lige bestilt garn, og kan regne ud, at jeg har købt 150 g for meget! Ret irriterende.. Die kleur is niet olijfgroen. maar turqoise. Hej Nanny, Vi skal lade din kommentar gå videre til design, jeg kan se at garnforbruget er rettet tidligere. God fornøjelse! Liebe Kerstin, am besten ist auf dem Foto zu sehen, wo Sie die 5 Kreise platzieren müssen bzw. wie sie angeordnet sind. Sie sehen ja ganz oben in der Mitte den ersten Kreis (der unterste 5. Kreis ist dann nicht mehr zu sehen, aber der untere Rand sieht ja wie der obere aus). Halbe Kreise benötigen Sie daher eigentlich nicht. Und in der Schemazeichnung unter der Anleitung sehen Sie, wie die halben Fächer am Rand angeordnet sind. Habe diese Decke gestrickt, ging überraschend schnell. Meine Familie und Freunde sind begeistert. Ik heb geen ervaring met rondbreinaalden maar heb wel wat video's bekeken. Naar mijn idee wordt er altijd in dezelfde richting gebreid. Toch wordt er in het patroon gesproken over een goede kant en een verkeerde kant, net als bij heen-en weer breien. Hoe zit dat ? Hoi Lita. Dit deken (= de waaiers) wordt vooral heen en weer gebreid op de rodbreinaalden. Alleen de 5 cirkels in het midden worden in de rondte gebreid. Skal igang med at strikke dette smukke tæppe. Ved gennemlæsning af opskriften undrer jeg mig over at hver halvdel af tæppet skal slutte med en række af fire vifter og to halvvifter. Men tæppet skal samles med fem cirkler.. Skal man ikke i stedet slutte hver halvdel med en række med fem vifter? Wer lesen kann ist klar im Vorteil ... Kreise stricken ist die Loesung! Klasse!! Liebe Theresia, jetzt verstehe ich erst, was Sie mit Ihrer Frage gemeint hatten - aber Sie haben ja schon die Antwort dazu gefunden. Viel Spass beim Stricken!